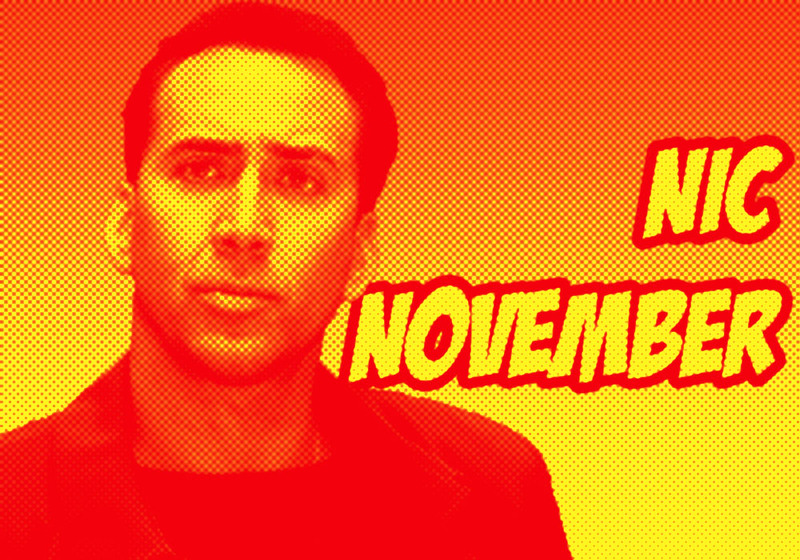 Here we are, back with some Nicolas Cage movies. I think I've already come to realise that the majority of his films aren't that bad - but then again, I am mixing the good with the bad: last week with Gone in 60 Seconds and the considerably better Lord of War, and this week with the awful Ghost Rider and the brilliant Adaptation. We can still have faith in good old Nicolas! I think that Nic should stay away from films that have him spending prolonged amounts of time in/on a vehicle. Gone in 60 Seconds was terrible. Ghost Rider was even worse. 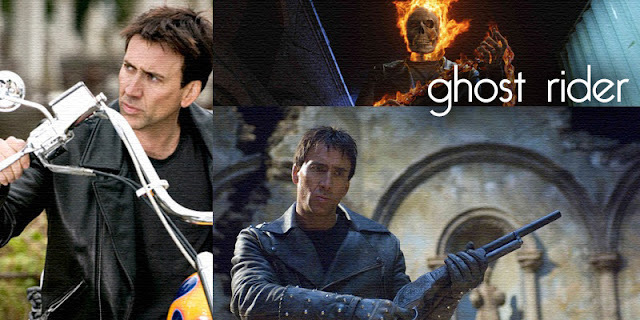 Basically, Nic is Johnny Blaze, a stunt man who likes to ride his motorcycle in dangerous ways and everyone resents him for it but he does it anyway. Oh, and he sold his soul to the devil. Mhm. Honestly, I think I checked out of this film from the first five minutes. It is all well and good that Johnny sold his soul to the devil. But when he runs around on fire, it just isn't that exciting. No one seemed terribly fussed about him running around on fire. I wasn't terribly fussed that he was running around on fire. It just struck me as a little incredibly weird, because...IDK, he was on fire. It just didn't make sense to me. But then again, I'm not sure that this movie was striving for sense. Something that also didn't make sense to me was the relationship between Johnny and Roxanne (Eva Mendes). Sure, they were little childhood sweethearts. Then they got torn apart. And then they came across each other again. Johnny creepily checks up on her, they fall in love, and then she is doomed to become the ragdoll thrown around by all of the bad guys (one of whom is Wes Bentley, which was also weird). It just shows how immensely lazy and eventless the movie is. Just like this review. Life imitates art...or whatever. Another example (and a far better example) or life imitating art lies in Adaptation. which brought Nic his second Oscar nomination. The film is a strange little project, as it is an autobiographical film written by Charlie Kaufman, based on his struggle to adapt Susan Orlean's book The Orchid Thief into a film. Nic stars as both Charlie and his fictitious twin brother Donald - who was also credited with writing the film and became the first fictitious person to be nominated for an Academy Award. This movie is about as strange as they come from the outset, but when your watching it, everything seems perfectly normal. Including dear old Nicolas Cage. This is probably Nic's best performance - and his performance in Leaving Las Vegas was pretty damn good. I think that he succeeds so well here because he is given a slightly crazy script, which means he doesn't have to really go out of his way to unleash every crazy bone in his body. He is somewhat restrained, and somewhat normal. Never once was I thinking "oh, here I am watching Nicolas Cage in a Nicolas Cage movie" - which is usually the biggest problem I have with his films. He's just wonderful, even when there's two of him. What do you think of these films, and how do they rank on the Cage Rage scale for you? I haven't seen Adaptation since it came out, but I loved it back then. Would need to see it again to see if it still holds up for me, but at the time I think it was my favourite film of that year. As for Ghost Rider... not going there except under duress. It really is a fantastic movie. But Ghost Rider most certainly isn't. Luckily I had chocolate by my side to get me through. I liked Adaptation but it was a bit of a letdown after Being John Malkovich. Cage was excellent though. I really need to see Being John Malkovich, pronto. Ghost Rider was indeed hilarious. I love Adaptation. It's so brilliantly meta. I just love how the third act of the movie becomes exactly what happens in the in-movie script, though it's what Donald wants it to be instead, which goes against everything that's been happening thus far in the film. If you think about it too much, your brain will melt. Ghost Rider makes me crave jelly beans. Adaptation I believe is one of Nic Cage's best work. It just shows what he can do as an actor instead of the bad movies he's doing. Nic Cage is sometimes wonderful, and sometimes horrific. I think that maybe his agent just brings him too many bad scripts, and apparently he doesn't have the ability to pick good ones from bad ones. One of my favorite Cage films is Matchstick Men. I thought it was greatly underrated. Maybe I am alone on this, but I really like that film. I really wanted to see that film but I couldn't fit it in :( I will get around to it one day.